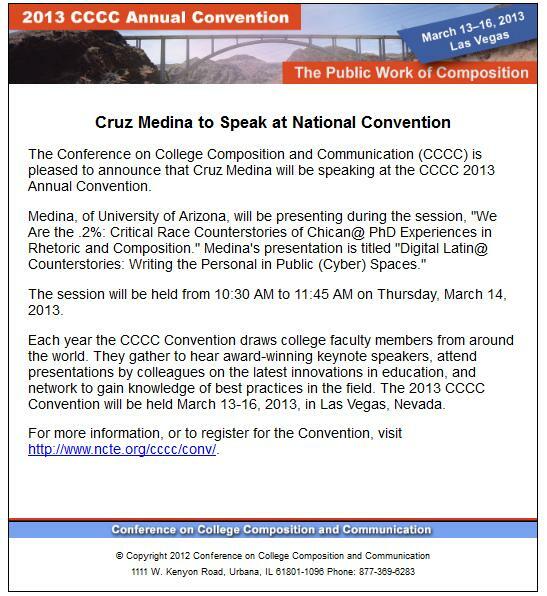 March 12-16 was the College Composition and Communication Conference, where I was most excited to present with my undergraduate research assistant Perla Luna, who presented with me on a panel related to my research on the NCTE/CCCC Latinx Caucus Bibliography. 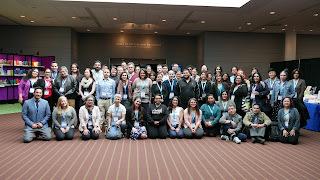 Below is the video of Asao Inoue's Chair's Address, which sparked some debate and discussion on the WPA listserv that prompted some discussion about the future of the listserv, its purpose, and how it is being used. 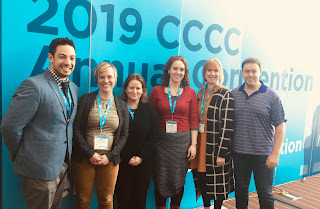 On Friday evening, I had the pleasure of co-chairing the NCTE/CCCC Latinx Caucus business meeting (photo below.) 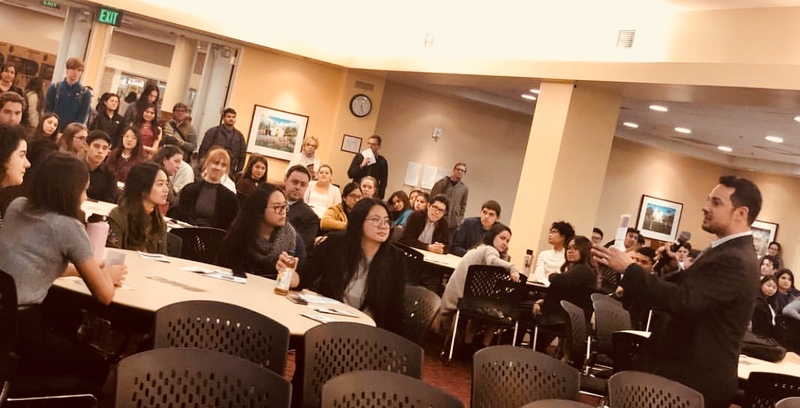 We had a wonderful turnout for the business meeting, where members of the caucus new and experienced came, met, and ideally found other folks interested in similar research, teaching practices, or community issues. My co-chair Christina Cedillo did an excellent job addressing some of the relevant issues that arose at this year's Cs and we worked together to spread the awareness of calls for papers (CFPs) and forthcoming publications by members of the caucus (see the covers below of books I picked up while there). Rhetorics Elsewhere is a collection that includes contributions by scholars identifying rhetorical practices outside of those traditionally included in classical rhetorical study. Raul Sanchez's new book continues his work as what Jaime Mejia describes as being "a monster theorist," looking at new ways of considering texts. 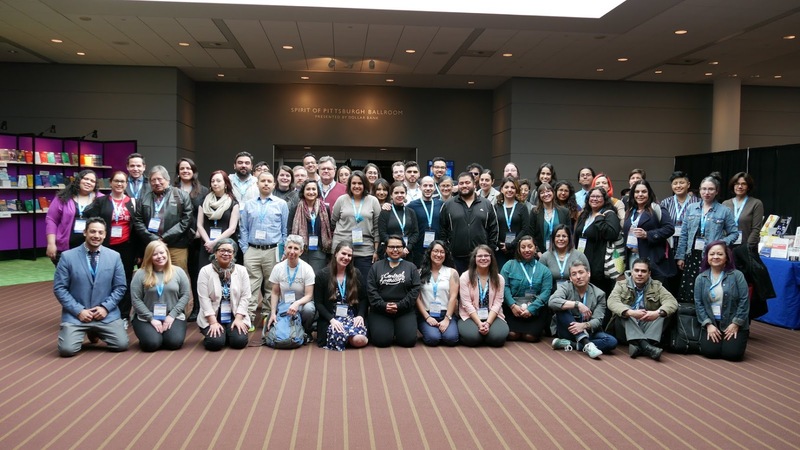 On the Wednesday of the conference, the Latinx caucus workshop hosted Latino Community organizations. This CCCC was also an opportunity to honor, Felipe de Ortego y Gasca, one of the founders of the Latinx Caucus who recently passed. 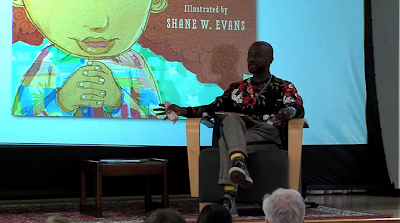 On Friday April 12, I was fortunate to have both Taye Diggs and his collaborator on children's books, visual illustrator Shane W Evans, come to my Rhetoric of Storytelling (English 106) here at SCU. In class, I framed the discussion around the course reading "Ancient Tradition and Contemporary Storytelling" by Gayle Duskin from the collection The Subject Is Story . The class identified contemporary songs that highlighted elements, motifs, and themes raised in the reading. 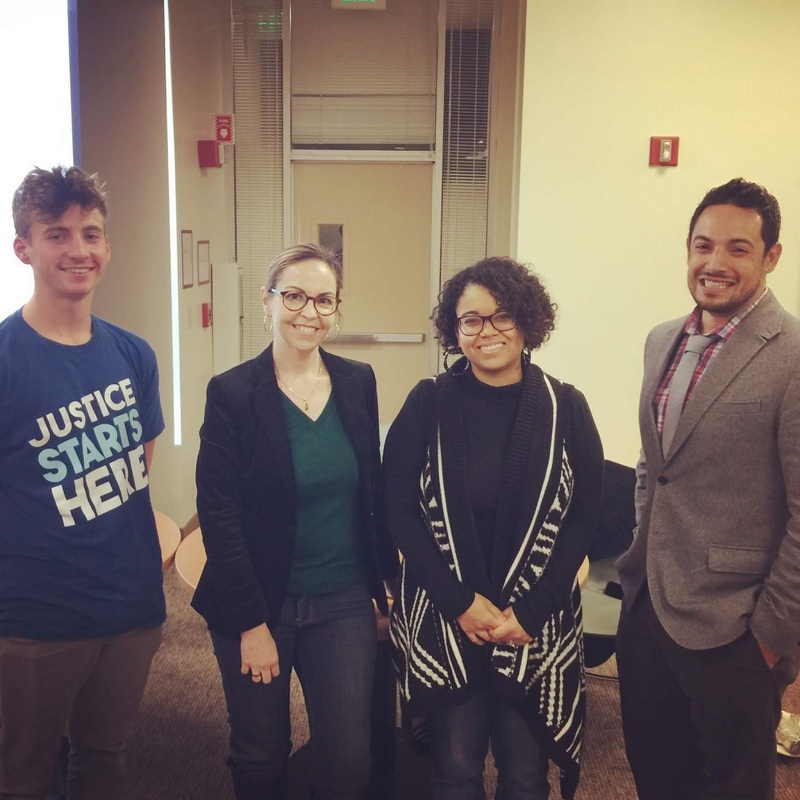 Diggs and Evans were extremely generous in their thoughtful contributions to the discussion, questions for students, and responses to questions from students on topics related to storytelling, telling the stories of others, and the purposes for storytelling. Diggs and Evans offered their perspectives as creators and collaborators in the stories of others. 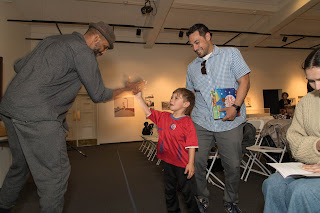 On Tuesday, April 9 Diggs and Evans performed a reading from their books Chocolate Me! and Mixed Me! . 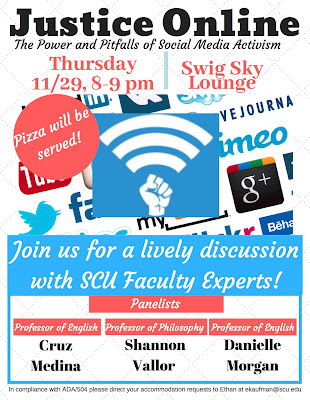 SCU has a video of the entire event that I'm including below, which includes musical moments that are at times collaborative with the audience, demonstrating the performative nature of the text as well as the rhythmic prose of both books. On Friday April 13, Diggs performed with SCU students in the choir, jazz band, orchestra, and dancers, taking the audience through some of his experiences as an actor and performer. Together, they performed songs from Rent, Chicago, and others. 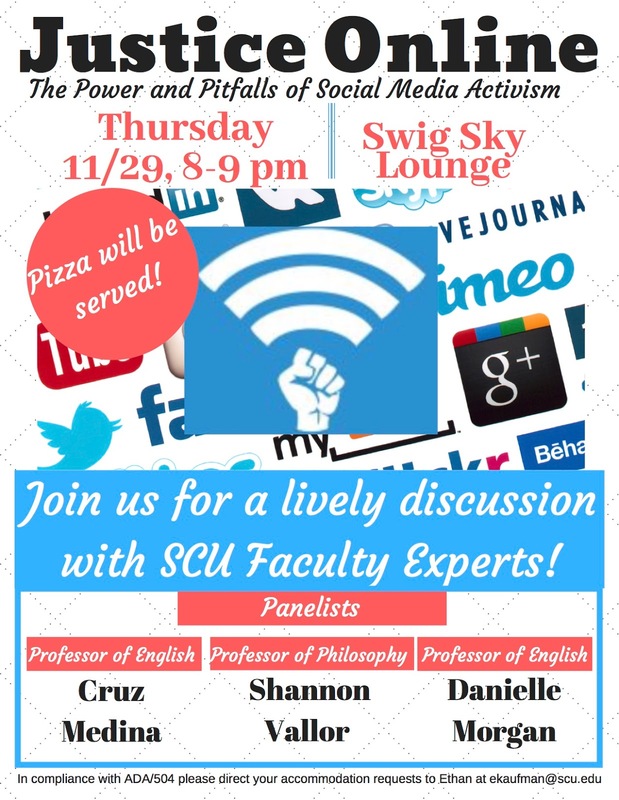 Thank you to Taye Diggs, Shane W Evans, and everyone at SCU who helped bring these awesome events together, including but not limited to Marie Brancati, Danielle Morgan, Christina Zanfagna, Tony Hazard, and the whole Culture Power and Difference crew. 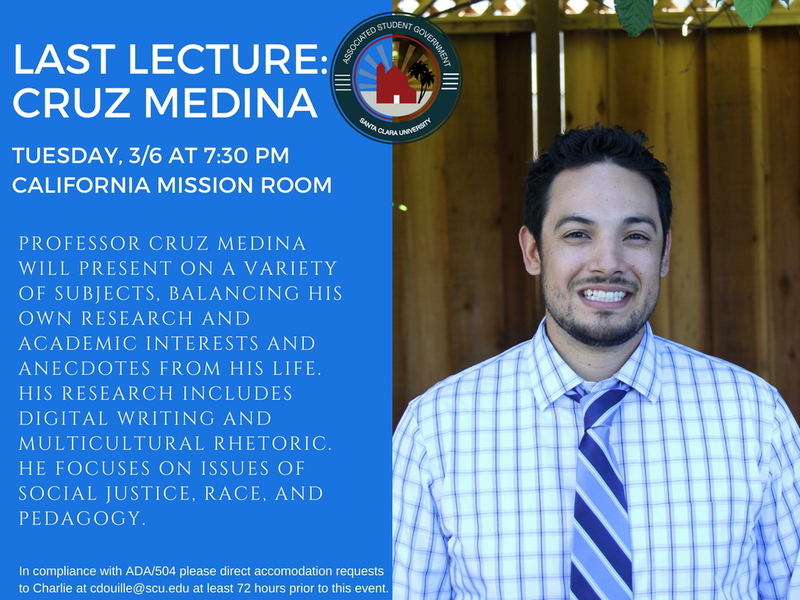 Last year, I was honored to be invited to deliver a talk as a part of the Associated Student Government's "Last Lecture" series here at Santa Clara University. I made sure to start off my talk by saying that I was neither leaving nor dying, but excited to be speaking with that great audience of students nonetheless. Here is a long-lost video that I found from my talk that was skillfully edited down to a highlight from the 45 minute talk I gave. I am really honored to have a chapter that came out recently, edited by the amazing editorial team of Angela Haas and Michelle Eble. 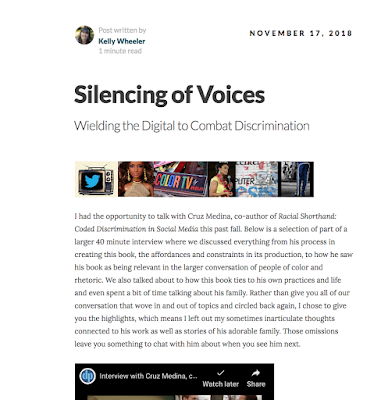 Contributing a chapter with Kenneth Walker on the subject of contract grading for social justice, drawing on folks like Asao Innoue, Jerry Farber, and folks in Tech Comm, I love that my work is featured along side dynamic contributors. This collection is compelling and necessary scholarship, especially given the moment when social justice and the humanities are needed. 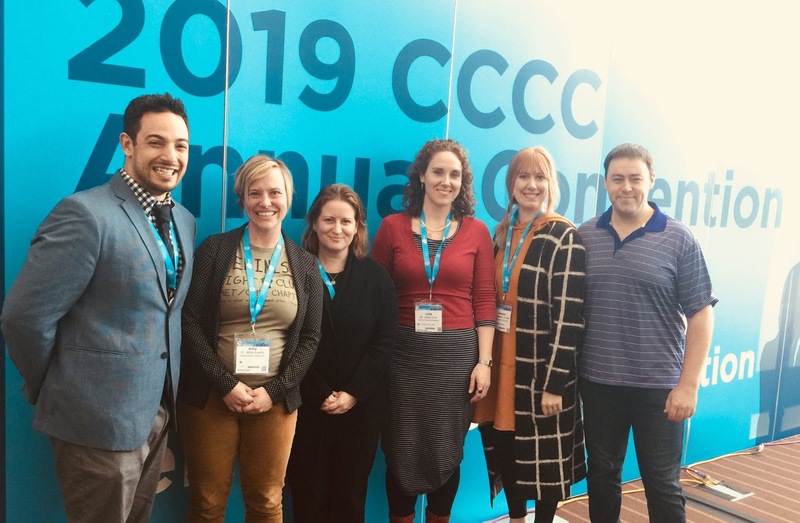 Drawing on social justice methodologies and cultural studies scholarship, Key Theoretical Frameworks offers new curricular and pedagogical approaches to teaching technical communication. Including original essays by emerging and established scholars, the volume educates students, teachers, and practitioners on identifying and assessing issues of social justice and globalization. 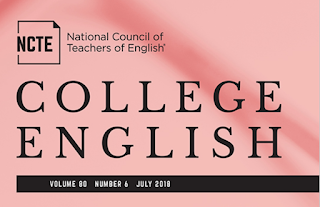 The collection provides a valuable resource for teachers new to translating social justice theories to the classroom by presenting concrete examples related to technical communication. Each contribution adopts a particular theoretical approach, explains the theory, situates it within disciplinary scholarship, contextualizes the approach from the author’s experience, and offers additional teaching applications. 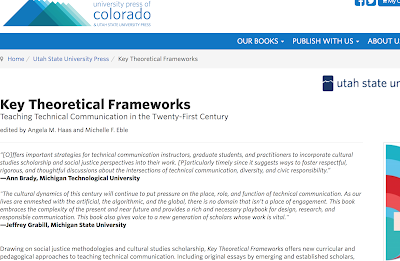 The first volume of its kind, Key Theoretical Frameworks links the theoretical with the pedagogical in order to articulate, use, and assess social justice frameworks for designing and teaching courses in technical communication. On Wednesday, Feb 20 the LEAD Scholars program hosted Symposium, an event where students from the first year writing classes (CTW2) present on preliminary research that stems from books they read over the winter break. 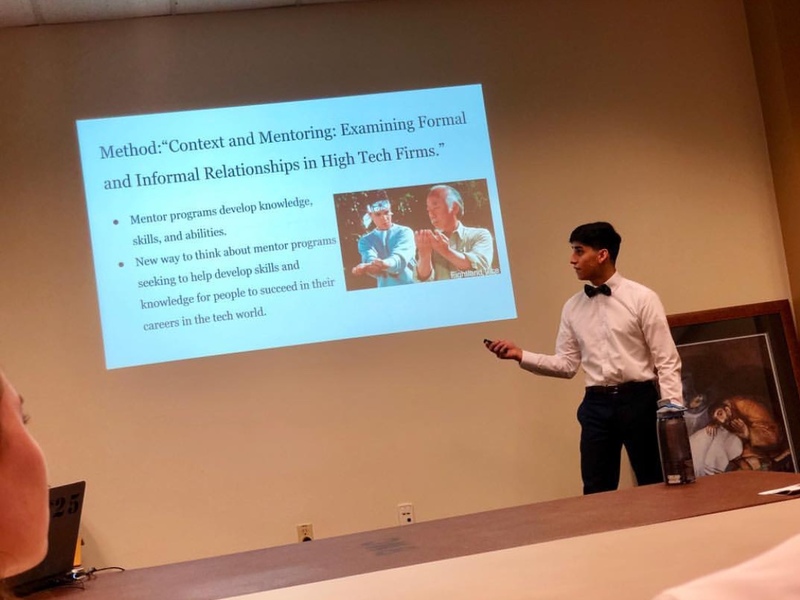 I was honored to speak on behalf of the LEAD CTW instructors, sharing our gratefulness for the event and the opportunity to share in the community that the program cultivates with their many curricular and extracurricular activities, sessions, and events. 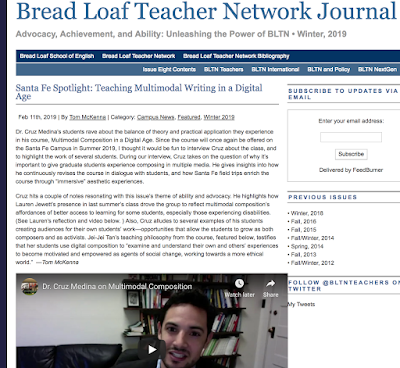 "Santa Fe Spotlight: Teaching Multimodal Writing in a Digital Age"
I am grateful to Tom McKenna for featuring work from my Bread Loaf course from the past summer in the recent issue of Bread Loaf Teachers Network Journal that also features an interview with yours truly. 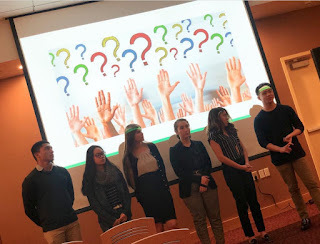 The two student videos featured are thoughtful and imaginative, speaking to important issues such as accessibility because one of the students, Lauren Jewett, works as a special education teacher in New Orleans. 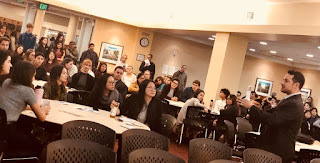 This past weekend, I am grateful to have attended a workshop with students from the SCU LEAD first-generation program at San Quentin hosted by Lesley Currier of Marin Shakespeare Company. 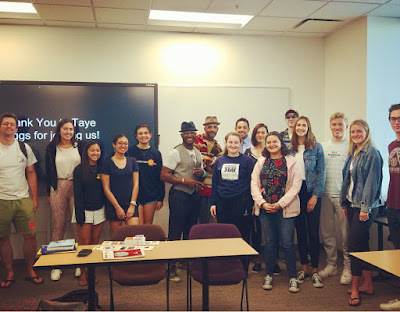 Our LEAD first year writing courses read Bryan Stevenson's Just Mercy: A Story of Justice and Redemption and the students who volunteered to take part in the workshop were motivated to learn more about the themes of justice and mercy. 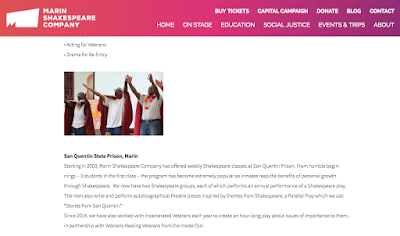 Shakespeare in San Quentin program has been around for some 16 years and men incarcerated in San Quentin have the opportunity to learn about and perform Shakespearean plays. During our time at San Quentin, our group had the opportunity to walk through the prison yard and speak with participants in the program before we began a more formal workshop in a small building on the parameter of the yard. The participants in the program were extremely welcoming and commented on the willingness of our students to engage and take part in the workshop. 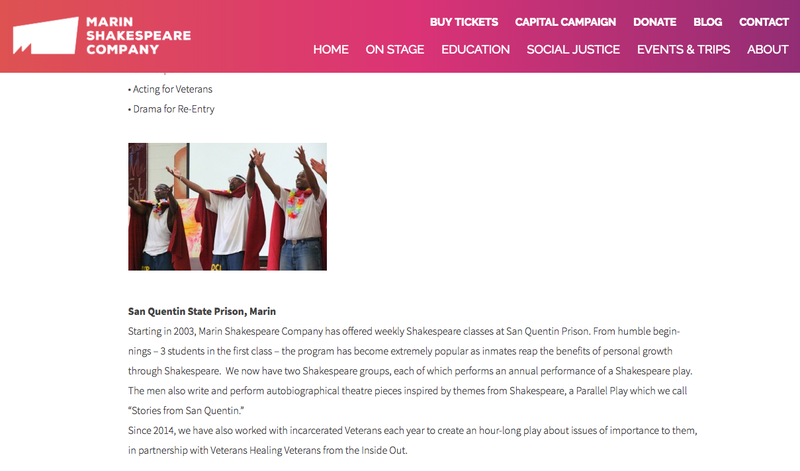 Our group had the opportunity to introduce ourselves and interact in large and small group sessions, talking with incarcerated participants in the program about scenes from Shakespeare's Measure for Measure and Merchant of Venice. In large group, Lesley Currier helped talk through the themes of justice and mercy in relation to the meanings of the monologues and in small groups; we had the opportunity to speak with members of the program about the relevant themes in the text, with many of them speaking about their own experiences and how they can understand how the themes Shakespeare wrote about remaining relevant in their lives. The many men in the program were welcoming and invigorated by working with younger people, with some men commenting that they had children or grandchildren the ages of our students. When we had a chance to speak with the men more informally after the workshop session, I spoke with a few who encouraged me to look at their writing on the San Quentin Shakespeare Workshop website because they were proud that they could share their stories, many of them focusing on how much they have changed as people because of their ability to take part in a program like this one. 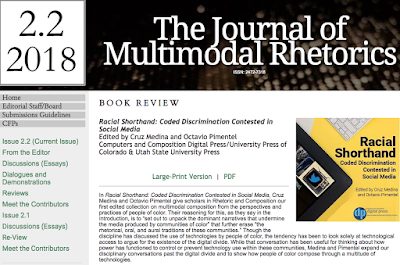 Muchas gracias to Les Hutchinson at Michigan State University for their review of the collection I edited with Octavio Pimentel Racial Shorthand: Coded Discrimination Contested in Social Media. Excited to have gotten my signed copy of Tales from la Vida: A Latinx Comics Anthology (Latinographix) . It's a beautiful collection of short selections of many Latinx comic authors with topics ranging from identity to pop culture to immigration and mythology. A few months back, I co-wrote an essay with Aja Martinez and Gloria Howerton responding to an essay College English had published on Tucson High School's Mexican American Studies program. We raised questions about the use of terms like "dead" and "illegal" that seemed to sensationalize the program, as well as suggestions for decolonial methodologies that resist colonial narratives about the absence of indigenous knowledge and culture in contested spaces like the Southwest.